Wild Run Salmon is owned by Matt Oxford. Matt moved from St. Paul, MN to Homer, Alaska in 1989. He got his start running the “Porpoise Room” a popular fisherman’s bar located next to the harbor. The bar cashed checks for the fishermen and it didn’t take Matt long too long to make a career change. He started working as a crab fisherman and continued to work as a Bering Sea crabber for the next 12 winters. In the summer he fished for Halibut and Salmon. He also helped start Coal Point Trading Company, a small processing plant located on the Homer Spit. It was at Coal Point that he learned the benefits of flash freezing fish that had been handled properly by the fisherman. Frozen fish had the reputation of being inferior to fresh. However, Matt learned that this was because most fish mongers were holding fresh fish as long as they could and then freezing it before it spoiled. But, if your fisherman takes a fresh salmon that has been bled and iced on the boat, vacuum packs it and freezes it within hours of being caught, you get a consistent product that is as good or better than fish sold fresh. In 2004 Matt bought the F.V. 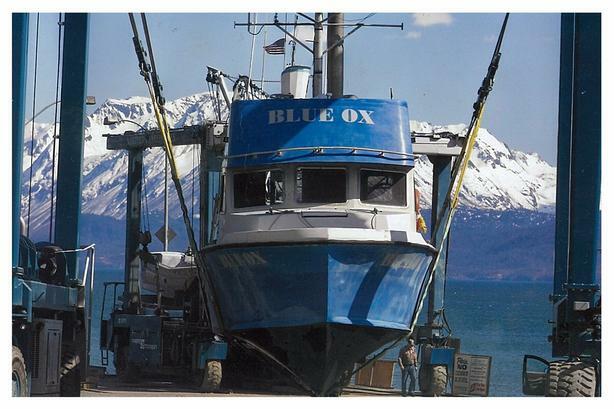 “BLUE OX” and started fishing in the Upper Cook Inlet. He fishes with his three sons George, Sam and Leo on the “Blue Ox” during the salmon season. The Cook Inlet has the best road access of any fishery which makes it possible for Matt to custom-pack his own catch instead of being forced to sell to the cannery. By caring for the fish throughout the entire process, Matt insures that the customers get the very best product. Best of all, Matt’s customers know they are making an ethical seafood choice. Alaska commercial salmon fisheries are carefully managed to ensure sustainability of the stocks. The Marine Stewardship Council (MSC) has certified Alaska’s salmon as “sustainable.” The Council is an international nonprofit organization that promotes sustainable fishing practices worldwide and guides consumer buying habits through eco-labeling. Numerous organizations have endorsed Wild Alaska Salmon as an ethical seafood choice, including Audubon Society’s Living Oceans campaign and the Monterey Bay Aquarium. There are no farmed salmon, not even those calling themselves “organic” that have those endorsements. Got a question? Give a call (651.999.9410) or email.